According to CNN, U2 singer Bono has just been discharged from a German hospital where he underwent emergency back surgery. 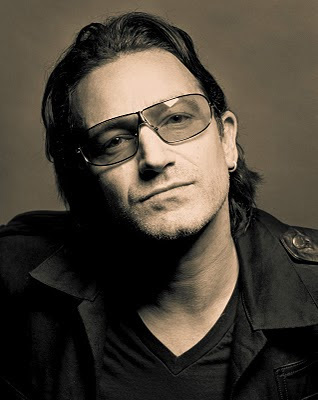 Bono apparently suffered a serious back injury on Friday while preparing for the continuation of the band's US tour. It seems the American shows will be postponed until next year. The group has also canceled an appearance at the Glastonbury Festival in England next month. "Bono suffered severe compression of the sciatic nerve. On review of his MRI scan, I realized there was a serious tear in the ligament and a herniated disc, and that conservative treatment would not suffice. I recommended Bono have emergency spine surgery with Professor (Joerg Christian) Tonn at Munich's LMU University Hospital on Friday." Bono is now "much better" and has regained all movement. "The prognosis is excellent, but to obtain a sustainable result, he must now enter a period of rehabilitation." Wohlfahrt indicated that eight weeks of rehabilitation is considered a minimum recovery period. Catch the latest updates on Bono and U2 at http://www.u2.com/. As best as I can determine, all of the US concert dates have been postponed until 2011.
Who said being a "Rock Star" is easy? Just an aside, if I'm ever assigned a doctor named/pronounced "Doctor Will Fart," I suppose I'll just giggle a bit. But don't give me a Doctor named Hurt, Paine, or Dye! I'll be forced to ask for a change! Traffic, Cell Phones, Fast Cars, and Accidents! If you look at the below photo on the left side you'll see a gentleman standing in the shoulder of the highway! Fortunately, I'm not that guy! Ever have a day when you say, "Wow; better you than me?" No, I'm not that guy standing in the shoulder of the highway, I'm merely one of the many people impacted by the fender-bender that caused this back up. (Get the pun.. Impacted?) I was safely sitting behind the wheel of my vehicle (and behind my trusty camera) but stuck in traffic on this lovely California freeway. What you may not be able to make out (unless you zoom in) Is that the guy in the shoulder is talking on his cell phone and staring at what is probably "his" smashed up car. I think this small blue car was on the receiving end of this smash up. Or the "Smashee." This sporty looking red car.... Probably the "Smasher." The good news.... No one appeared to be hurt. Here's my take on these things. I hate being stuck in traffic, especially when I'm going somewhere. And guess what? If I'm in the car, I'm usually going somewhere. Los Angeles is known for traffic but honestly, every big city has traffic and if you pick the wrong time of day and the wrong route it will take longer. You might as well plan accordingly. Cell phones are great! There's so much capability these days packaged into these compact devices. You can pay your bills, take photos, browse the web, listen to music, check and send emails and so much more.... But driving down the freeway at 80 mph is not the time to be texting or looking away from the road. And if you're one of those people who can't walk and chew gum at the same time, you probably shouldn't drive and talk on the telephone at the same time either. Know your limits. I'm not a big lover of "Fast Cars." Yeah, they look cool and go fast and make lots of noise but where can you drive them? You usually can't enjoy the speed of a fast car because there's too much traffic. If you try to drive them like they were meant to be driven, the cops will pull you over and write you a ticket. Or else, someone pulls in front of you quickly and you become a smasher. I look at cars more for their utility and comfort. Can I carry all of my crap inside of it? Can it get me to where I need to go? Through the snow, ice, mud, hills, mountains and such. Does it have enough leg room? How's the stereo? You know.... things like that. Accidents- Simply put: I don't like accidents. Especially if someone gets hurt or if it's my fault. Accidents are no fun at all. Well, that's all I have to say about these things... so be careful out there because someone is driving really fast and talking on their cell phone or texting and it's gonna cause an accident and back up the traffic! Courageous or Dumb? Running shoes are Bad for you! Christopher McDougall, the author of the national bestseller, Born To Run has a courageous idea when it comes to running shoes and runners who wear them. Throw your running shoes in the trash! Christopher McDougall claims that the entire multi-billion dollar (running shoe) industry "is based on a campaign not of facts, but of fear. Fear that if you don’t buy a $175 sneaker and replace it in three months, you’ll ruin your knees." 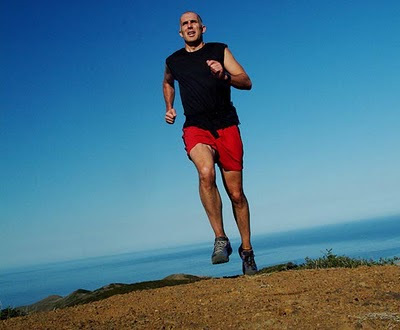 He claims that humans have evolved in a manner that makes running barefoot better for your muscles and joints and that the technology introduced via the running shoe is actually bad for you and promotes injuries. Nike, naturally has a different perspective! Well, clearly this is a tough debate. I haven't read McDougall's book yet but he seems to present a valid argument. But for now, just between us....... I'm keeping my running shoes! Today, it occurred to me that in the past few weeks I've unintentionally become a huge promoter of Malcolm Gladwell and his books. I've found myself in no less than 4 extensive social and business conversations where his books and the subject matter of his books have been the focal point of discussion. At the end of these discussions, I've felt more like a salesman than ever before. I'm thinking of calling Gladwell and asking for a percentage of his gross sales. It all started for me when I read the book "Outliers" after a close friend suggested it. He was so jazzed about the book and kept saying.... "This is right up your street." I really wanted to prove him wrong.... (I hate it when he says "right up your street") So I went out and bought the book last Fall. The somewhat steep $27.99 price tag for the hardback copy was slightly mitigated by a 40% discount coupon that I had for a Barnes and Nobel purchase. I'm sure it's in paperback by now or in your local library. Needless to say, I read the book and found it quite illuminating. The book was fascinating from the start. I was drawn in by Gladwell's analysis of hockey players and birth dates and his discussion of the "Matthew Effect." I held on and enjoyed his writing style as he discussed "The 10,000-hour Rule", The Beatles, Bill Gates, Paul Allen, Steve Ballmer, Steve Jobs, and others..... I felt the book stalled a bit in the middle and I found myself laboring through the center chapters. I woke up towards the end and felt engaged as he discussed "The Ethnic Theory of Plane Crashes" and other affable topics. Ultimately, I was a bit surprised at the end of the book as Gladwell introduced another one of his interpretations of "opportunity" and shared a personal story. I won't go too deeply into that idea because I don't want to create a "spoiler effect" for those who haven't read the book yet. "I'm very anxious that this book not be seen as a self-help book but as a community help book..... What I really want people to do is start thinking about how we as a society can build institutions that provide opportunities to work hard." 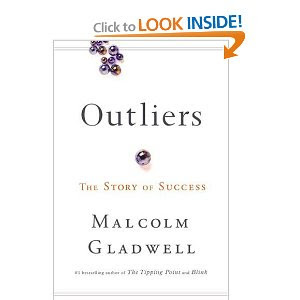 If you're thirsty for more Gladwell, click here or on the photo of the "Outliers" book above. 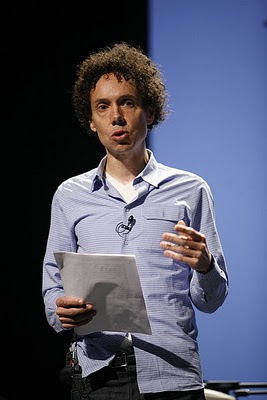 It will take you to a link to a video where Gladwell discusses his book in more detail. It's a nice presentation and summary of the book. Gladwell who has been a staff writer for the New Yorker since 1996, "has written on a wide range of topics, including the science of cool hunting, race and sports, physical genius, the concept of moral hazard and health care, and the difference between puzzles and mysteries..." Clearly I find him interesting to read, but he's very interesting to listen to as well! 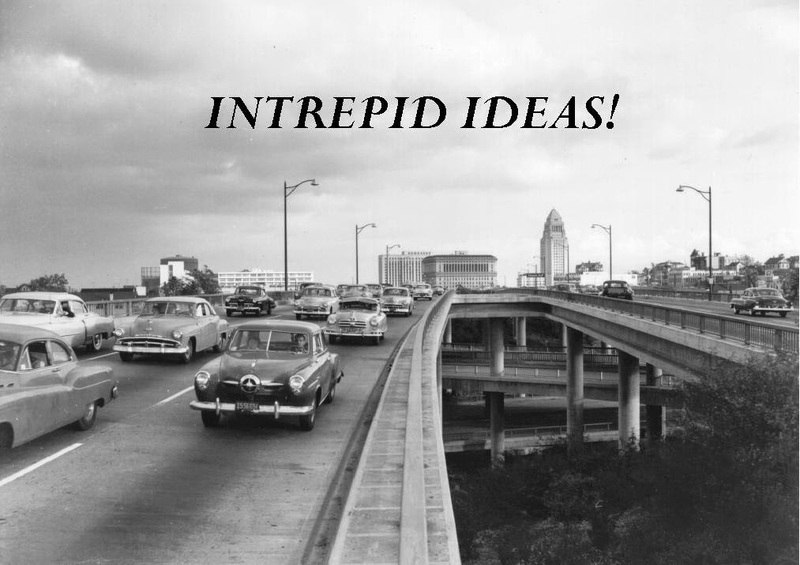 He strikes me as a "Funky, Nouveaux, Intellect" and I like the way he critically explores Intrepid Ideas. I think I'd enjoy sitting down to a Martini with him one day and talking about ..... Whatever! No, it's the NBA and they've got a fine for you Dwight Howard! I'm a little late to the party but let me pile on anyway. I was scrolling through my Blackberry today looking for a distraction from the "Helter Skelter" stock market ride and I rolled across this story about Dwight Howard being fined for a Blog comment. I had to read the story twice - and I couldn't believe it either time. 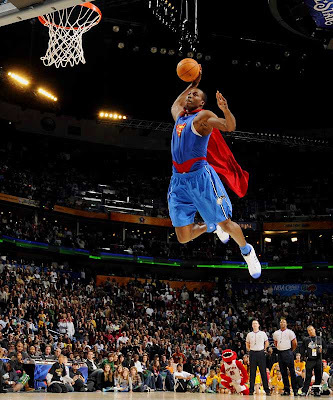 Yes, the "freakishly big" Dwight Howard, who plays basketball for the Orlando Magic and sometimes doubles as Superman, was fined $35,000 for a comment he made on his own Blog! I guess he's not too big for the NBA to beat up. "Ya’ll know that that series against Charlotte drove me crazy. I mean it was almost comical at times how I was getting fouls called on me. There was nothing I could do our there and I felt like I couldn’t even move without getting that whistle blown on me. I’m not looking to say anything to get myself in trouble with the league, but I just don’t see other star players getting called for fouls the way I get them. No star player in the league is outta games the way I am. I even talked to Pat Ewing about his career and he said he never had foul trouble like what I’m going through. I gotta say this is the most frustrating stretch of my career. I’ve never been through four games in a row like that. But hey, we won the series and we’re moving on. I’m so so so hoping that things will be different next series against ATL or Milwaukee." Wow. I don't quite know what to say about this event. Frankly, I didn't find his comments that offensive. But get this; this was the second fine on Howard for comments he made on his Blog. Back in November he was fined $15,000 for similar comments he made on his Blog. Just goes to show you, Blogging can be an expensive habit! After all of that, here's some light entertainment for your viewing pleasure. 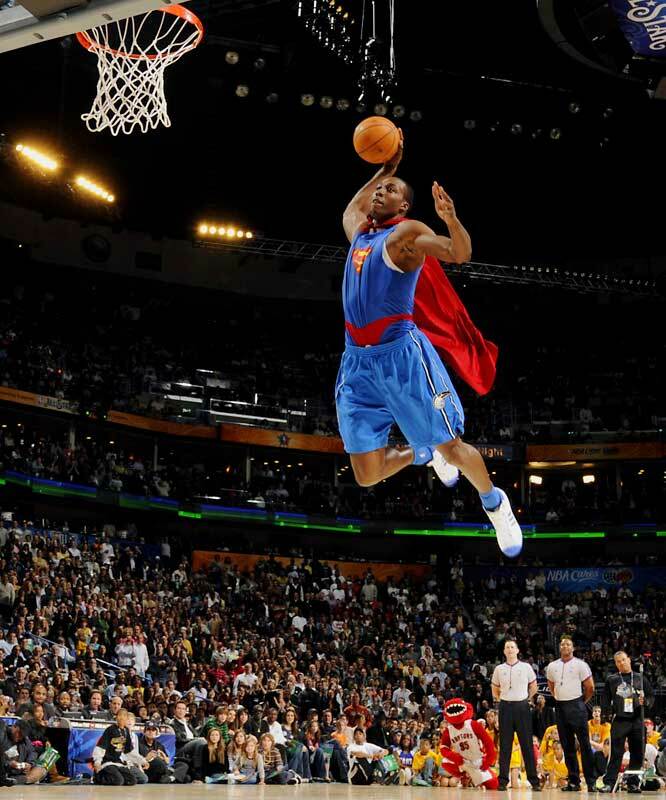 Now watch as Dwight Howard Dunks on a 12 foot rim. If you've ever been to Paris, perhaps you've strolled by a bronze and marble sculpture by Auguste Rodin held in the Musée Rodin. It depicts a man in sober meditation seeming to be engaged in a powerful internal struggle. The piece was originally named The Poet, and it's said that Rodin based his theme on The Divine Comedy by Dante and The Thinker was originally meant to depict Dante in front of the Gates of Hell, pondering his great poem. Rodin made a first small plaster version around 1880. The first large-scale bronze cast was finished in 1902, but not presented to the public until 1904. It became the property of the city of Paris – thanks to a subscription organized by Rodin admirers – and was put in front of the Panthéon in 1906. In 1922, it was moved to the Hôtel Biron, which was transformed into a Rodin Museum. 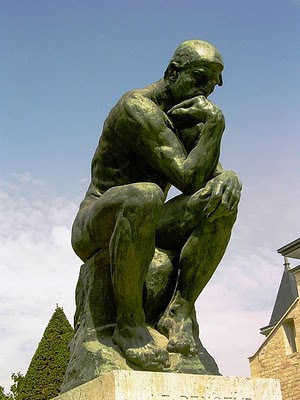 Unlike any other piece, this work of Rodin seems to epitomize what I consider to be "true intellect." Without question, It stands as an icon of unadulterated deep thinking. But what exactly is "True Intellect" and what constitutes "Deep Thinking?" I've recently wondered if there is really any "True Intellect" left in this world. 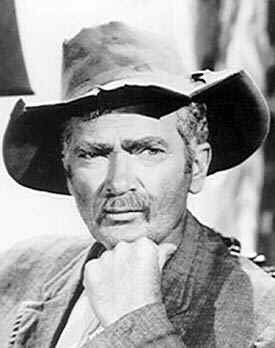 I'm here to tell you that Uncle Jed Clampett (from the TV show The Beverly Hillbillies) is now the "Big Cheese" of thinkers in my book! "Now Jethro, Don't Commence A'Swimmin' Until You Hit The Water!" I tell you, I had to stop what I was doing and sit down and ponder this complex literal masterpiece. Wow, I was stymied! I'm not nearly as quick as good ole Jethro. But after a few minutes of deep intellectual thought myself, I was able to come up with the true meaning of this statement. Uncle Jed was trying to tell Jethro to "slow down.... Don't put your cart ahead of your horses... Or hold your horses. " In other words, "Don't get ahead of yourself. Timing is everything!" Cosmic Thinking uncle Jed. I'll be using that phrase a lot in the near future! I'm sure you're all familiar with the movie "The Good, The Bad, and The Ugly." Some of you, like me, have seen the movie countless times. It's certainly one of my favorite spaghetti western movies. There's a lot to enjoy. I think the acting is good, the story is well told, and the music score that accompanies the action, is great. The main theme to Sergio Leone's film The Good, the Bad, and the Ugly, was originally composed by Ennio Morricone but a follow-up version by Hugo Montenegro went on to reach #2 on the Billboard Hot 100 chart and spent four weeks atop the UK Singles Chart in 1968. It sold over one and a quarter million copies, and was awarded a gold disc! You didn't come here to read about ancient music or movie history, you want to see and hear about the ugly parts of my Mexico adventure. Don't you? I'm warning you, it could get a bit scandalous and border on pornographic. But that's my disclaimer, so continue at your own risk! The ugly story starts like this: "Don't Eat The Worm!" Billygan's Island is a Restaurant & Beach Club in Cabo San Lucas. They serve breakfast, lunch, and dinner on the sand at Medano beach. It's a lively and fun place and is a big attraction for the young and old alike. And guess what? Happy hour starts at Noon and runs until 7 PM. Did I mention that it's a popular destination for college kids on Spring Break? That's when it starts to get ugly! Too much sun, too much tequila, too much mezcal, too little "drinking" experience = UGLY! 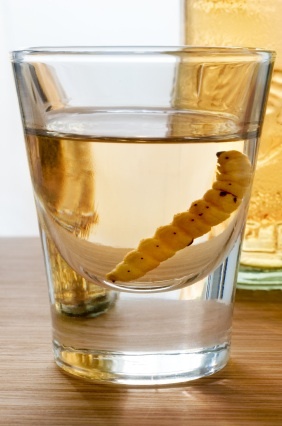 Note: In the United States, the reputation of mezcal suffered from its association with college binges on cheap mass-produced bottles sold with the agave larvae at the bottom. It has not become as popular as tequila in the U.S., because of its smoky flavor. A number of bartenders, especially on the West Coast have been working to make mezcal cocktails, but the liquor’s smoky flavor makes this a challenge. There is one that combines the mezcal with agave nectar, yellow chartreuse, pastis, fresh oregano and lime juice. However, mezcal does not have a signature drink such as the margarita for tequila. Okay, some of you - namely Dickster1961 and MickisMorsels - called me out on the "Bad" Mexico post. To be fair, you both make a strong case. Yes, it's hard to complain about some things in life but trust me, when I put my whining hat on, I can go with the best of them. But thanks in part to you two, I'll try to be a little realistic! (grin) as I share the "Bad" parts of my trip to Mexico. If nothing else, maybe I can add some humor. Here's a not so perfect one. The sun is obscured by the clouds. -Bad! Okay, take a really nice beach and pack it with people! Too crowded! Bad! Go all the way to Mexico and shop at Wal-Mart! Way Bad! Guys with automatic weapons on the crowded beach - Puts me in a BAD mood! Going to Mexico and eating and drinking too much (and not getting sick)! Not a Bad way to spend a week!